In the spring of 1938, two enormous weather systems stormed ashore in southern California. The associated rainfall was almost biblical in proportion. Before the greater Los Angeles area began to dry out, nearly 6,000 homes were washed away, buried in landslides, or simply submerged, never to be occupied again. Over one hundred people had died. But those weren’t the storm’s only casualties. North of Los Angeles, in Yosemite National Park, not far from the northern terminus of the John Muir Trail, the storm would claim nine more victims. The Transcontinental & Western Air airliner, a Douglas DC-2, left San Francisco about thirty minutes after sunset. In command was Captain John D. Graves. Although just thirty-five years old, Graves was an experienced and accomplished pilot. While wearing the uniform of the Army Air Corps he received a measure of fame, years earlier, as the pilot who located and dropped supplies to a group of Indians in the snowbound wilderness of northern Arizona. His co-pilot, C.W. Wallace, was six years younger. A third TWA pilot, who was off-duty, was on board, as well as the flight hostess and five passengers. A TWA DC-2, much like the one that disappeared near Yosemite. 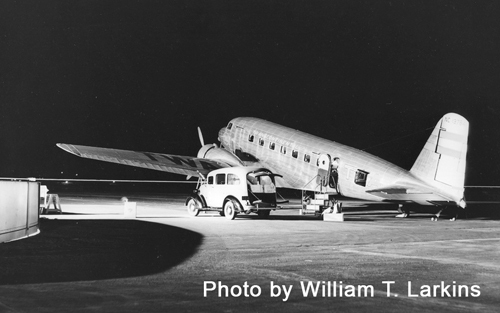 The flight was bound for Winslow, Arizona, on the first leg of a trip that would eventually take the airliner, the most modern of its time and capable of carrying more than a dozen passengers, all the way to the east coast. There was fuel enough aboard for six hours of flight. The route was not a direct one. Graves would fly south, staying well west of the Sierra Nevada, and then turn east towards Winslow. He made it about sixty miles south of Bakersfield before his aircraft was afflicted with one of the most serious of weather-related problems: icing. He informed the airline’s ground controllers that he was abandoning Winslow as a destination, and pointed the nose of his aircraft north. Icing was nothing to mess with; he wanted to land as soon as it was safe to do so. All of this was well before radar, instrument navigation systems, and (needless to say) GPS. Navigation of the day involved mostly looking down and seeing what was below you. Graves turned north, probably heading for Bakersfield. If he missed Bakersfield, there was always Fresno, even farther north. There was no further contact with the aircraft. The search began the next day. It went on for months, but peaked on March 5th, with fifty planes and nearly 300 searchers on the ground. The bad weather made it an almost impossible task. The day the flight disappeared, the snow level had dropped to two-thousand feet. In the backcountry, the snow fell at a record pace. A report that the plane had been sighted near Huntington Lake, well south of Yosemite, was the only real clue as to where the aircraft might be, so the search was concentrated in that area–the wrong area, as it turned out. One hundred and three days after the crash a just discharged Civilian Conservation Corps worker, by the name of Collier, hiked out from Wawona towards Buena Vista Peak. There are two theories as to why he headed in that direction. His story was that he had adopted searching for the aircraft as his personal hobby. He claimed to have explored large swaths of the Yosemite backcountry, during the preceding months, using his own secret system to predict where the aircraft had crashed. This hike to Buena Vista Peak was just the next area to search on his list. The alternate theory was that he had found the wreckage, accidently, earlier, but had waited to officially “discover” the location until after he was discharged from the CCC. Had he announced his discovery before his discharge as a federal worker, he would not have qualified for the $1,000 reward. Regardless, he returned from his hike with enough artifacts and a detailed enough description that it was clear he had found the missing plane, about eight-and-a-half miles east-northeast of Wawona, sixty miles north of Fresno. The plane and the bodies of its occupants, who were likely killed on impact, were recovered. In the past couple of years Yosemite has acquired a bad reputation as a dangerous place. Two summers ago there were a spate of waterfall-related deaths, and last summer there was the Hantavirus scare, which claimed three lives. It’s interesting to note, however, that the single most catastrophic accident in the park–the one incident that caused the most loss of life–was a plane crash. Interesting bit of history, thanks. I’m always fascinated by the early 20th century and how people got along before all the modern conveniences we enjoy today. Tragedy, too, was much more common in those days, as this story illustrates. Our grandparents were rugged folks, that’s for sure! This is actually one of two plane crashes within the park. The other is quite a story as well. A future blog post, no doubt!